A harrowing image of the inevitable end of earthly life sweeps off the heads of those who have achieved the greatest prominence among mortals. The scythe held by an outsized figure of Death cuts through the heads of the elite, leaving sprays of blood on its sharpened edge. The range of people taken in its wide swath includes powerful rulers and high clergy, followed to the right by those of self-won distinction. This full-page illumination comes at the end of a manuscript compiled for Günther von Herberstein, a nobleman from the region of Styria in southeastern Austria. Among other moralizing tracts, it contains an extremely popular allegorical work on the game of chess, authored by the Dominican preacher Jacobus de Cessolis. The vanity of worldly pursuits is emphatically summarized by the stern image of death, which puts an end to ordered social life, to be replaced by the Last Judgment of the souls of humankind as equals before Christ. From the left, following the moving image of a small boy, appears a pope, leader of the Catholic Church, wearing the three-tiered miter of his rank. He is succeeded in turn by the Holy Roman emperor, a king, a cardinal with a red hat and a bishop of the church. Behind the dominant of the earth are grouped a tonsured monk, a laurel-crowned poet, a soldier and members of the upper middle class. 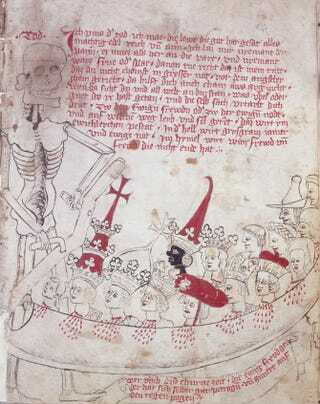 In the center of the crowd is a black ruler, his crown topped by a high, conical red top. The position of the black king among the elite of European society seems slightly anomalous. His head is set somewhat awkwardly above the others as an isolated motif. Further, of all the crowned monarchs, only he looks ahead in strict profile. Another clear difference, it hardly needs pointing out, is his distinctively dark complexion. With his snub nose and thick lips, he is clearly characterized as black, while the convention of white, fluffy hair is rendered exactly like that of the European monarchs, apparently used as a unifying device to associate him with their rank. The artist’s emblematic rendering of the Christian world distills the political and social condition of Europe during the volatile period of the early 15th century. By this time, the awareness of blacks not only as people but also as nations had begun to coalesce in the Western consciousness. These new polities could now be included in the diplomatic agendas of the various European powers. In retrospect, the relatively short transition between the late Middle Ages and the Renaissance proved to be a period of positive embrace of Africa and its leaders, a tentative phase of engagement brought to a tragic end by the fast-approaching, cynical exploitation of its people through the practice of slavery. By 1419, the time this manuscript was made, the motif of the profile head of a black man had long been established in European art and culture. The so-called black Moor had emerged as a popular device within medieval heraldry during the 13th century. In German lands he was associated with kingship and often wore a crown. Elsewhere, he was commonly depicted with a simple band of cloth worn around the temples, tied with fluttering ribbons. The meaning of the Moor’s head was ambiguous but alluded to a powerful martial presence well outside the confines of Europe. He could be friend or foe, a potent ally or a defeated enemy whose image demonstrated the superior prowess of European forces. One is tempted to associate the black king with Prester John, the enigmatic ruler long thought to exist in some unexplored region ranging from India to the vast sub-Saharan area of the African continent. The rulers of Europe held out hope for aid against their enemies from this enigmatic Christian potentate. Often represented as black, he became an ideal symbol of the expansive agenda of the Holy Roman Empire. By the time this manuscript was made, Prester John had become associated with Ethiopia. Together with Maurice, the martyred Roman saint, Prester John was appropriated as a symbol of universal conquest by the imperial cause. The meaning of the profile black head had also come into much greater focus. European exploration had gradually reached into parts of sub-Saharan Africa. Consequently, this greater awareness of distant lands takes on a more specific meaning in the illumination. Though conservative in style, the crowned king appears as the leader of a dark-skinned people in Africa—a ruler, if not of flesh and blood, at least one thought to possess real power. In this fundamental sense, he is the equal of the other rulers around him, as capable as they are of maintaining the interests of his realm. An actual example of venerable black royal prestige was already emerging in the European consciousness. In 1441 Emperor Zara Yaqob sent an embassy of high-ranking courtiers and church officials from Ethiopia to the bustling Italian city of Florence to attend an ecumenical council of Christian churches. Their mission envisioned nothing less than the reconciliation of all branches of the faith throughout the world. Though in the end nothing came of this ambitious initiative, the impression of Africa and the extraordinary nature of its people became much more concrete to the European world than before. In fact, in an unrelated case, a dynastic marriage had recently been proposed between the kingdom of Aragon in Spain and the royal family of Ethiopia. In the image of assembled monarchs swept away by Death’s scythe, the black king finally takes his rightful place. He is regarded as a worthy companion to kings and emperors, facing the same political intrigues on earth as well as the same crucial test of spiritual worthiness at the Last Judgment. All those who appear before Death, including the black king, are rendered as generic images of their station in life. Shortly afterward, this late-medieval, encyclopedic treatment of the human condition began to yield to the less symbolic form of the individual persona. The appearance of the black king facing Death with his equals provides one of the last examples of such a shorthand acknowledgment of black power and its inclusion in the expanding compass of the Western world.